Simon Peter was not having a good morning. You don’t have to be a commercial fisherman, as he was, to understand that. Just imagine your own job at its most frustrating. Perhaps you’ve just spent several hours cleaning house and the kids come in from school, scattering books and jackets all over your neat countertops and tracking up your just-cleaned floor with their muddy boots. Or you just can’t make the accounts balance no matter how many times you take the numbers apart and put them together, while your boss is glaring and drumming his fingers on the desk. Or your fidgety students are giggling and squirming, merrily ignoring the lesson you worked so hard to present. Then consider the brutal reality that, if you didn’t get your work done, you wouldn’t get paid. Life was a lot more simple–and ugly–in the first century. No fish, no money. Simon’s family may not have been able to eat that day. So there he was on the lake shore, weary and worried, washing out his nets after a fruitless night. When he finally returned to his boat, ready to stow it away and get some sleep, he found Someone in it. Now we know Jesus was born a common man to common parents—people you would find every day among the villages of first-century Palestine. And yet… There had to be something, something special about Him that made one look up and take notice. Simon certainly did. For, tired and cranky as he was, he allowed this itinerant preacher to use his boat and even rowed it out for Him. Moreover, he didn’t lean back against the mast and sneak in a nap while Jesus was teaching. 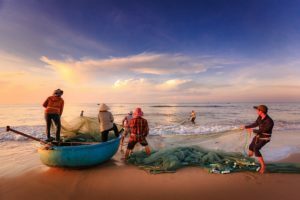 For by the end of the talk, Simon called Him “Master.” And on the strength of Jesus’ word alone, he called his partners, went back out to sea and let down those heavy, water-logged nets one more time. We know what happened next: the men hauled in “a great shoal of fish”—so many their nets were breaking. That “something special” he’d sensed leaped into flaming life before his eyes. Simon fell to his knees before the One Who created fish and the oceans confessing his sin–probably including the grumbling about Jesus sending him back out in the first place. And Simon’s life was changed forever. I stand amazed at the faith of those first disciples. May I be as willing as they were, even if it means continuing to serve Him right where I am.